Pardlo’s reading covered a wide range of subjects, with gorgeous, startling images – “The bat above me like a flung wrist watch,” and “She makes jewelry of herself and garlands the ground with shadows.” Prufer observed the personal woven into a number of the poems, and Pardlo referred to method acting (the idea that an actor should, to an extent, emotionally become his or her character). Pardlo discussed the adaptation of perspectives offered from real-life subjects that, once skewed to the purposes of a poem, can both open imaginative possibility, and release the writer from obligations to the literal. Prufer’s questions were thoughtful and thorough, and gave both poets opportunities to showcase their experiences as writers and readers. One highlight was the question of what poetry, or any art, owes to politics and activism. 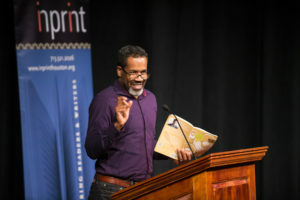 Pardlo suggested artists should work to frame major concepts of the day and articulate unspoken anxieties, to “get behind blind spots we create culturally, that also obscure real concerns.” Limón pointed to the complex emotional capacity poetry can offer in consideration of a question or questions, rather than answers, in ways other media cannot. 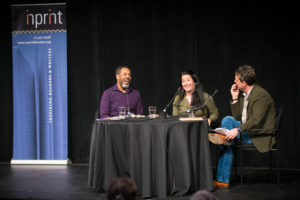 The discussion closed with recommendations from both writers – Limón named When My Brother Was An Aztec by Natalie Diaz, as well as the non-fiction work Braiding Sweetgrass by Robin Wall Kimmerer. Pardlo shared an ongoing interest in St. Augustine’s Confessions, all of which are available at the links provided. 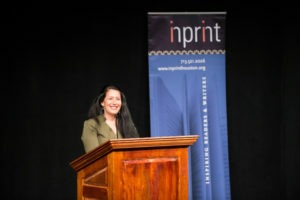 Video of the full reading and interview will be forthcoming here in Inprint’s archive. Join the reading series next in May to hear from novelist Colm Tóibín. Tickets available here.